We cannot respond to crime without also responding to what causes crime. While many have assumed that poverty is a main factor, studies now show that it is actually income inequality—the gap between a country’s richest and poorest income earners—that has a larger impact on crime rates. 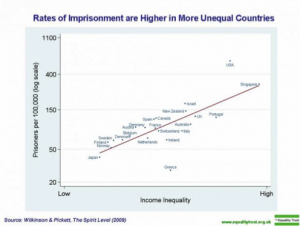 Countries with higher income gaps have lower levels of social trust and higher rates of crime—including violent crime. Therefore, we need to ask our politicians for answers to crime that include addressing income inequality. 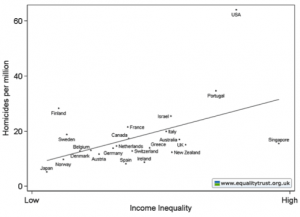 Income inequality affects social social inequality. It affects health, education. housing, whole neighbourhood blocks and the services they receive. And now we know that incarceration, which has been our primary response to crime, further affects social mobility and income inequality not only for offenders but for their their children, increasing the prospects for more crime. Smart Justice recognizes that crime prevention and justice responses must focus on health, education, economic inequality, social mobility: strategies more effective than levels of punishment. In Canada, the income gap has grown: The wealthy have seen their incomes rise rapidly, while middle income Canadians have seen their income stagnate and lower-income Canadians have seen theirs drop. That imbalance leads to higher levels of obesity, mental illness, addiction, teenage pregnancy, property crime and violence throughout an entire population—not just for the poor. Homicide rates are higher in countries with higher levels of income inequality, including in Canada. Income inequality has been found to be an important factor in the rates of murder, robbery and theft, car theft, property damage, and to a lesser degree, drug offences. Small reductions in income inequality are associated with large reductions in both violent and property crimes. 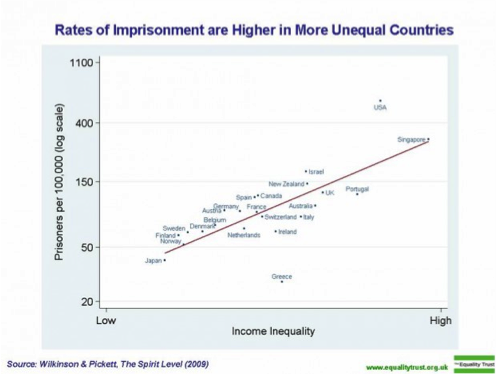 Countries with higher levels of income inequality also have higher levels of imprisonment and longer sentences. This prison growth is linked less to actual increases in crime than it is to increases in the call for punishment-based responses to crime. While these responses don’t lower crime rates, they do divert funds away from education, health care, housing, and support for those with mental health issues. responses to crime that don’t feed into the income inequality–crime cycle, but rather prevent crime before it happens, and reduce reoffending by offenders who are back in the community. Our politicians are in a position to make decisions that create health in our communities—but we have to push for them!